Perhaps you are an amateur or a non-pro who did not grow up around cattle … and now you still don’t have many opportunities to be around them or work them. You’re not alone. Maybe one of the few times you do get to experience cattle happens during a show run. That’s very challenging and less than ideal on the job training! As you already know, there are a lot of moving pieces and parts to this whole idea of becoming proficient working a cow. The most efficient learning approach I know is to break those pieces down into bite size chunks and tackle them one at a time. The purpose of this article is to address a very important part of the cow puzzle … how to tell “good” cow behavior from “bad” cow behavior. When you scroll down, you’ll see a list of desirable and undesirable cow behaviors. These cow characteristics are noted in the context of herdwork with a group of cattle. Enjoy! The cow sees the horse, pauses, looks and then walks on at an even gait. The more the cow looks back to “check out” the horse, typically the better the cow. Avoid: A cow that moves quickly away from a horse and pushes aggressively through the herd. Also avoid a cow that allows a horse to get close to him without moving. The cow appears relaxed and not “bothered” by the activity around him. Avoid: A cow that is super alert, tight muscled, ears back, tail swishing and/or easily agitated by horses, people, movements or noises around him. The cow keeps an even top line when he moves around. Avoid: A cow that is high headed or extremely low headed. 4 – Travels everywhere at an even pace. The cow moves at a steady gait. Avoid: A cow that darts anywhere or moves sporadically. 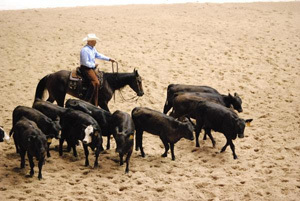 5 – Is comfortable at the front of the body of the herd as a horse works in front of him. The cow is interested in the activity of the horse working in front of the herd as demonstrated by remaining at the front of the herd and watching the horse as he works. Avoid: A cow that remains close to the back fence, seeks the back fence or does not want to drive out. 6 – Is comfortable alone (without the comfort of the herd).